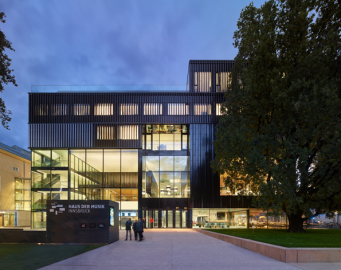 Situated on one of the most prominent spots in the center of Innsbruck, the “House of Music” is designed as an open house with generous insights into the interior. 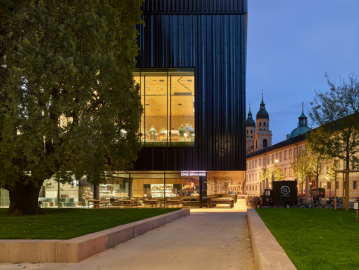 In close conjunction with the Landestheater, it creates a new urban center, surrounded by the historical neighboring buildings. 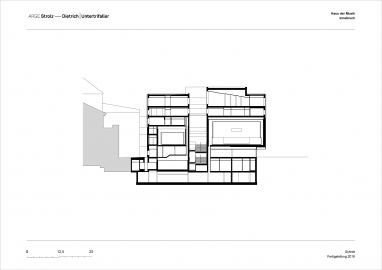 The large volume establishes an exciting composition with a high potential for identification, while at the same time sensitively responding to the urban context. 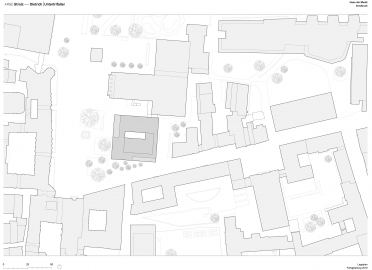 The transparent plinth zone with the foyer facing the square as well as the open stage area of the Great Hall on the upper floor create a fascinating dialogue between the urban space and the cultural events inside. The Great Hall becomes an open-air stage, the square an auditorium. 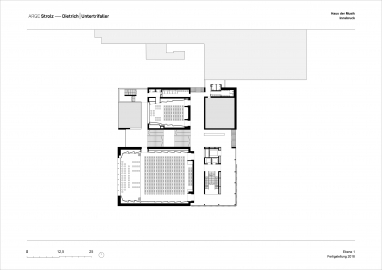 The multifunctional complex accommodates the Intimate Theater (Kammerspiele), two concert halls, the State Conservatory, the Institute of Musicology and the Mozarteum, and also serves as a place of work and research. In addition, rooms are available for the Tyrolean Symphony Orchestra, three regional music associations, the Festival of Ancient Music (Festwochen der Alten Musik) and restaurants. The top floor with event rooms and library is open to the public. Its terraces offer a magnificent view of the city. The arrangement and organization of all areas are very clear and functional. An atrium naturally lights the zones around the central access core. 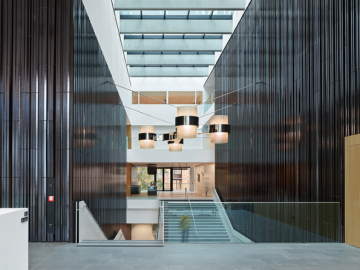 The light-flooded panorama staircase connects foyers and performance venues on three levels. Visual connections and insights promote communication between visitors and users. Two further stairways lead to the top level. 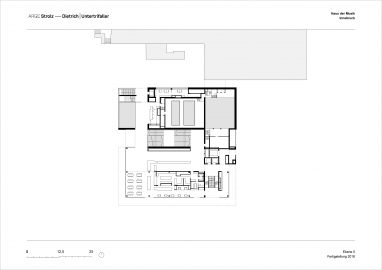 They create meeting points and simplify orientation and wayfinding within the building. 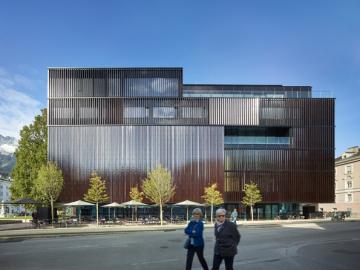 The façade is clad with dark, vertically structured ceramic panels. A storey-high "lamella curtain" made of ceramic elements protects the glazed surfaces from solar radiation. The free arrangement and brilliance of the various opaque profiles reflect the sunlight as a complex line pattern in light brown to black iridescent colours. The glass surfaces of the three-storey foyer and the Great Hall reflect the surrounding historical buildings and the forecourt with Leopold Fountain and three trees, protected as natural monuments. Despite its homogenous character, the changing light situations by day and at night create exciting and lively effects. 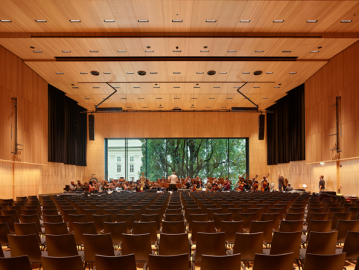 The stimulating play between transparent and closed, between light and dark continues inside the building – velvety black walls in the Kammerspiele; light, warm wooden panelling in the concert halls. The entire height of the vertical development tower is visible inside as a reinforced concrete body. Erich Strolz won the EU-wide competition in 2014 with a convincing solution for the complex space programme. 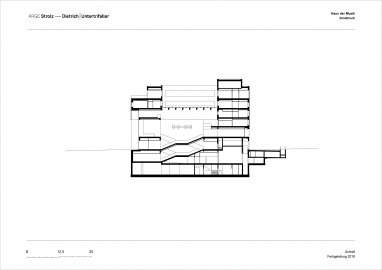 In cooperation with Dietrich | Untertrifaller, the project was further developed and realized in only three years.